Home / Bridesmaids Buzz / Erica & Joe's wedding! 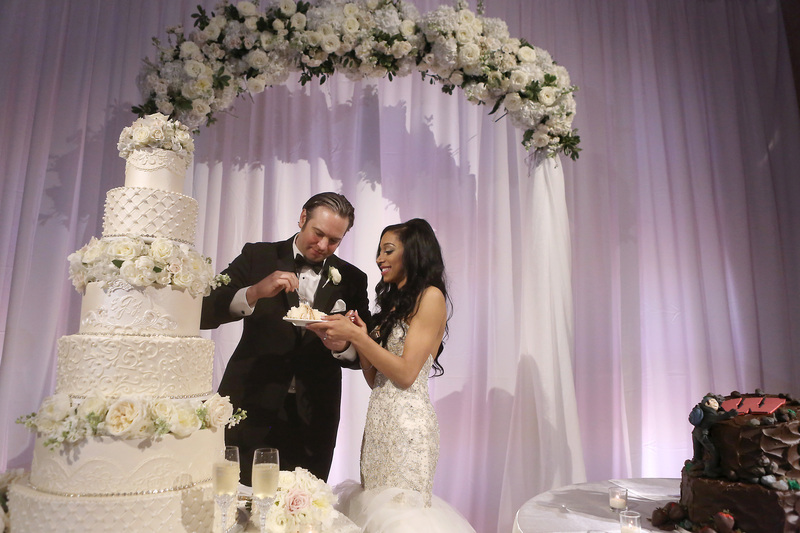 This couple planned a classic affair filled with lush white and blush arrangements, and a fun French twist! 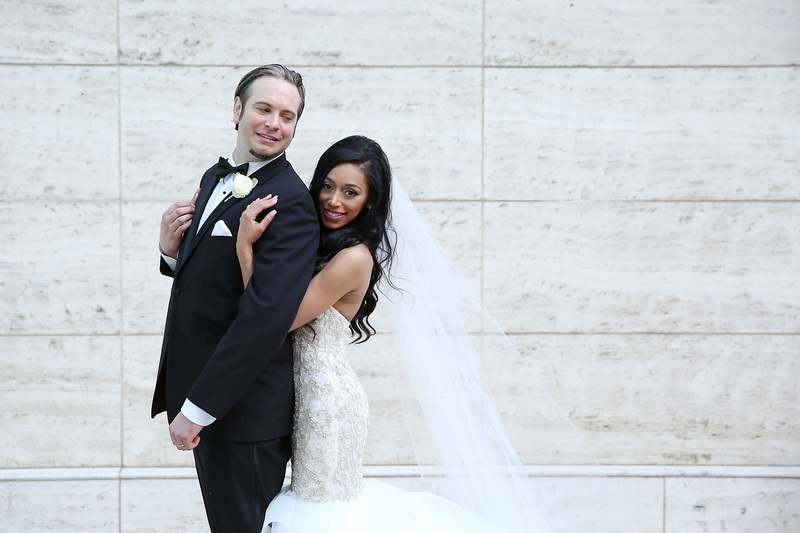 Erica & Joe met and fell in love over email, but knew they were the perfect match from the start! 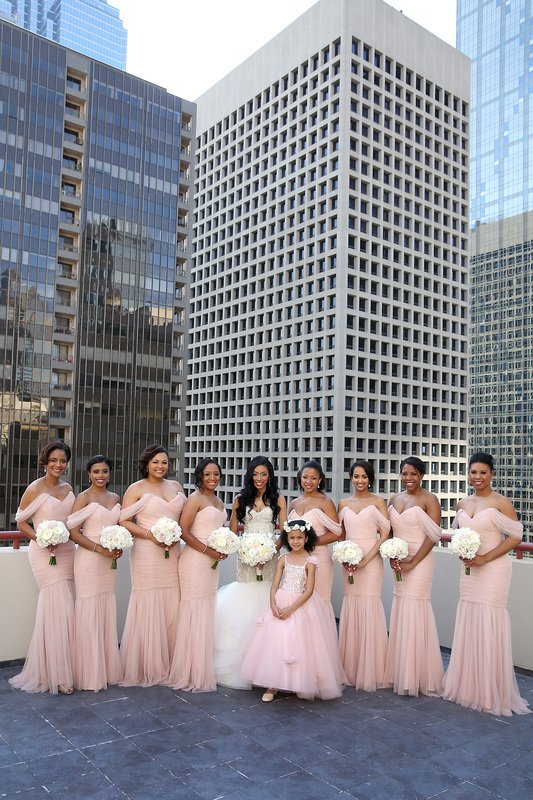 We're totally obsessed with this couple, and we are lovin' the bridesmaid style, too! Match.com! Joe and I got to know each other by phone/email for 6 months before meeting in person and after the first date, we've been together ever since. 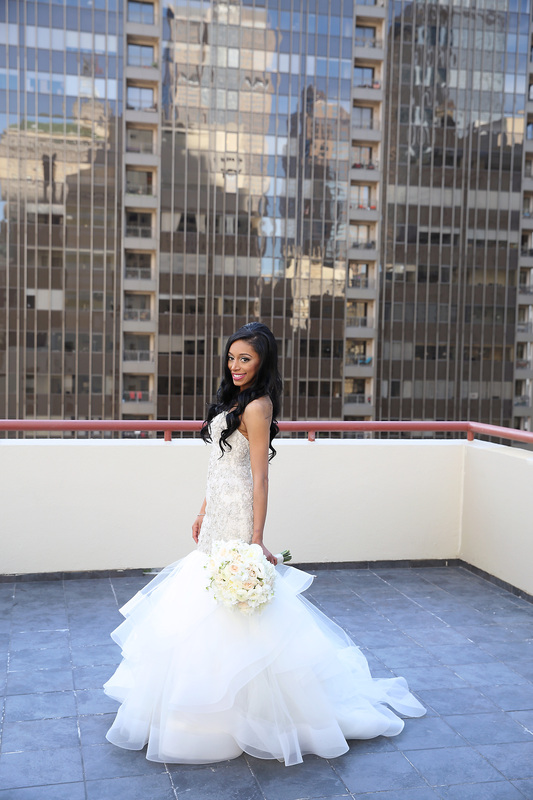 The big day happened on February 28, 2015 at The Ritz Carlton not too far from our apartment in Downtown Dallas. Joe planned a "special getaway" where he simply told me to pack well because we had a lot of activities planned, and to get ready for a very long drive. The long drive ended up being two blocks when we pulled up to the Ritz. I gave Joe a puzzled look and asked if we were about to have brunch at the hotel restaurant before hitting the road, and he then told me we had arrived to our destination. After checking in, we had our bags brought up to our suite and Joe had room service bring up lunch for us to eat. Shortly after settling into our room we headed to the spa where we were treated to a long relaxing couples massage. After the spa, we went back to the room to relax for a while before going to dinner. About an hour before we were to head to dinner at Fearing's (our favorite Dallas restaurant and located inside of the hotel) Joe had a bottle of Champagne and chocolate covered strawberries brought up to the room. The time for us to head to dinner was fast approaching and I couldn’t decide on what to wear. I tried on two different dresses and Joe told me he liked the second dress better. Then, he told me that there was still something drastically missing. I gave me a puzzled look and then I realized I had forgotten to put on my bracelet. After putting on the bracelet and earrings, I said to Joe, "How about now? Does this look better?" Joe said, "No, something is definitely still not right. There's definitely something still missing". I knew I had nothing left to throw on, so I shrugged and then, Joe said, "In fact, I think I'm going to have to get on my knee to help this situation out." At that point Joe walked up to me and dropped to his knee, reached into his jacket pocket, and pulled out the ring. He held it to me and asked me if I would make him the happiest guy alive and be his wife. I said yes! After spending some time taking in the moment and holding each other, we headed down to a wonderful dinner at Fearing's to help celebrate the very special occasion. 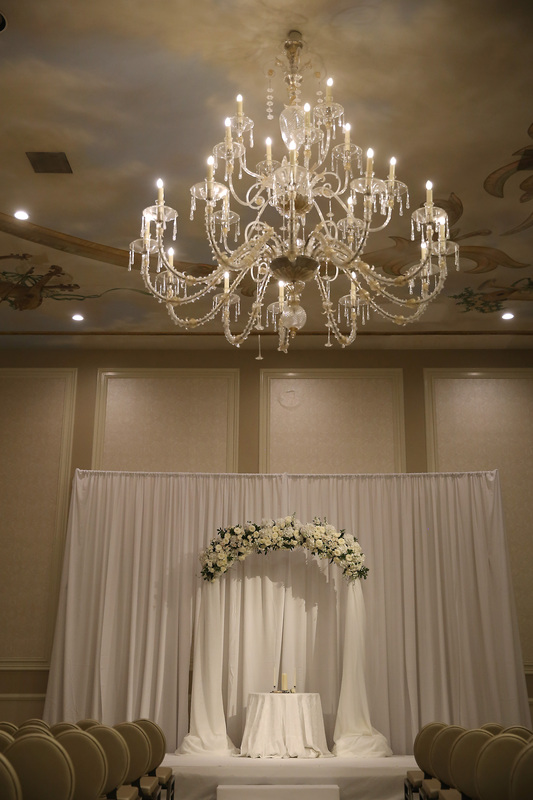 We knew we wanted a formal wedding, so we looked for hotels in the Dallas area that were gorgeous and would set the mood. 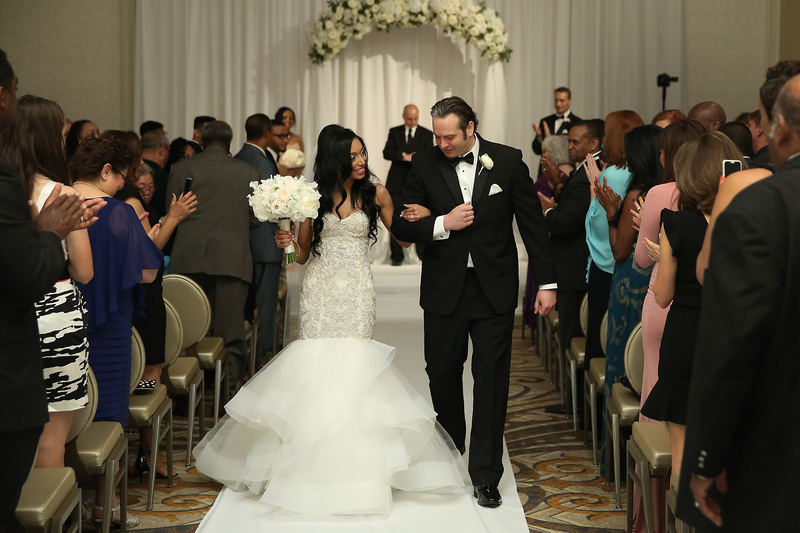 We wanted our out of town guests to feel a part of Dallas where we met, so we chose The Adolphus, a historic hotel in Downtown Dallas, to have our wedding. 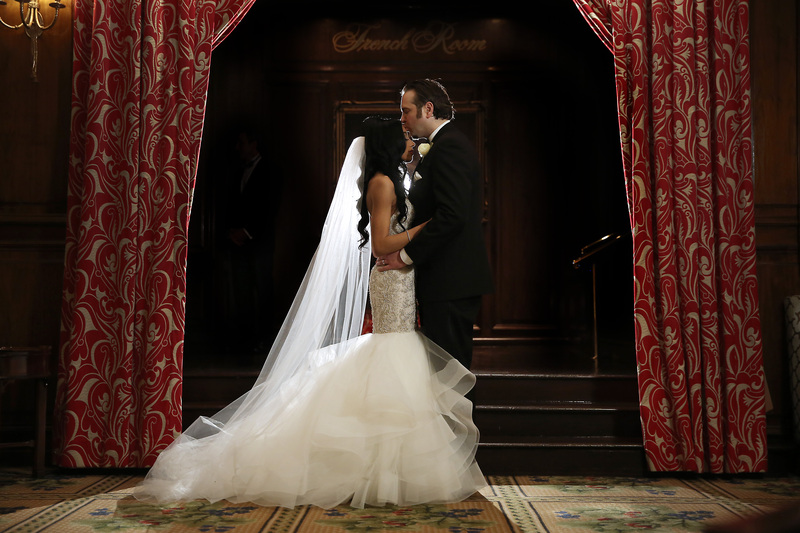 We knew from the moment walking into the Grand Ballroom that it was the venue for us to have our wedding. 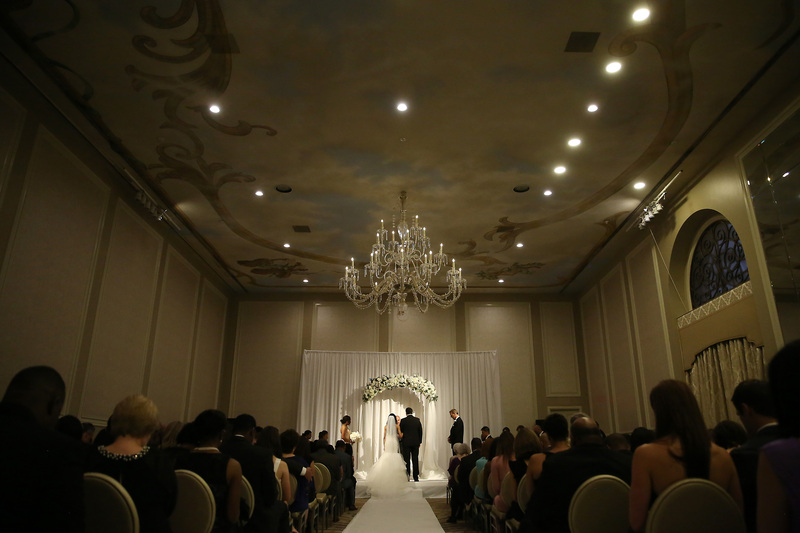 If we would have gone with a destination wedding, it would have definitely been in France, but since we wanted to make it easier for our guests to make it to our wedding, we chose Dallas and The Adolphus has a French inspired feel that was perfect for us. Lazaro designed my ceremony gown and Eve of Milady designed my reception gown. I went for a traditional white ceremony gown and a blush reception gown to dance the night away in. They were both purchased from Stardust Celebrations. 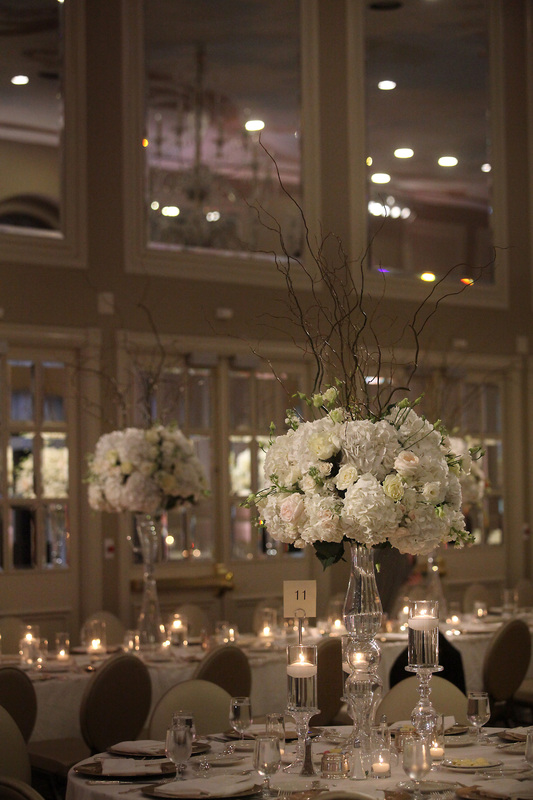 I'm in love with white and soft colors, so we went with an all white floral design with hints of blush tones. Our theme was elegance, romance, and glamour. 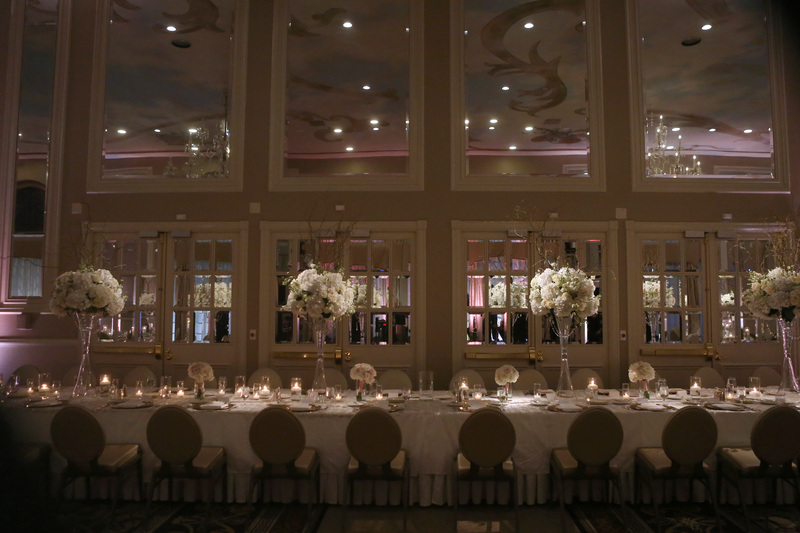 We had gorgeous chandeliers hanging from the heavenly painted ceiling, gorgeous flowers all throughout the venue, and crystals hanging from our centerpieces to give the glamour. Candles graced the room everywhere to give the romantic feeling. We had our band playing lovely music during the course of the dinner to give elegance while mingling and eating, and after that, the party started. The entrance to my second gown was doing a second line. Since I am from Louisiana and Joe and I visit New Orleans together, we decided to give our guests a bit of Louisiana culture having a second line that got everyone up on their feet. Everything was to be super gorgeous, yet warm and inviting. I walked into Bella Bridesmaids Dallas, the first and only bridesmaids store I looked at, already knowing what dress I wanted. I brought my Mom and one of my bridesmaids with me to model the different dresses I chose, but I saved the best for last. I knew that the Amsale dress that I chose was the dress of my dreams to have alongside me on the wedding day. The dress was perfect and when I walked out of the store and my bridesmaid asked if I would be looking anywhere else, I said, "No way. I've found my bridesmaid dress, which is the kind of dress I've always wanted to wear in a wedding". 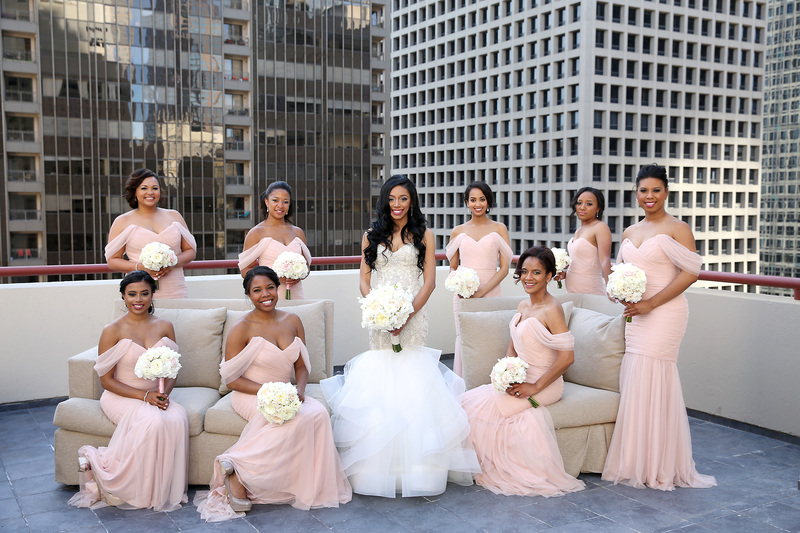 The blush color was so soft and elegant and having the pretty tulle hanging off the shoulders was so beautiful. I had the girls wear their hair up to show off of the romantic dress and dangling earrings that I got them all as gifts. This is a bridesmaid dress that can be worn to another wedding or any formal event again. It won't be stuck in the closet! 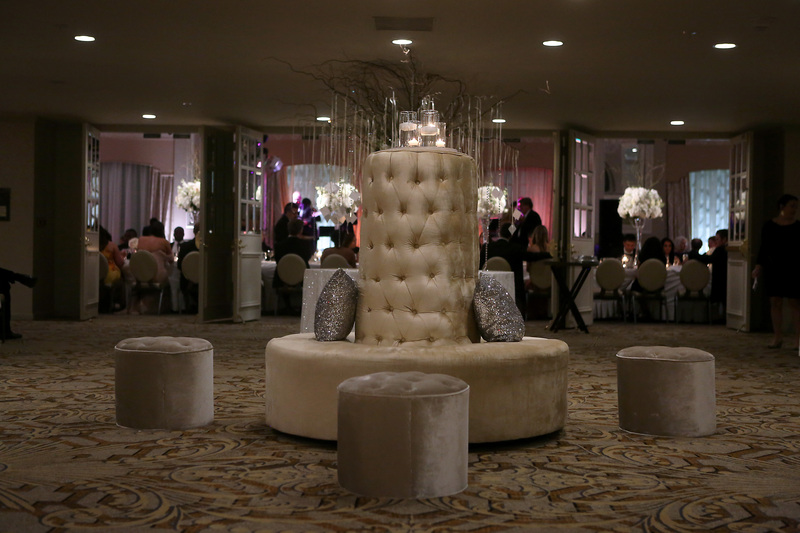 My must haves were lots of flowers, white décor with minimal color, and accents of blush only throughout the room. I couldn't live without a super sparkly gown, and I chose two gowns to have the best of both worlds to go with my wedding colors (white and blush). If I could do anything differently, it would be nothing at all. We had the best day of our lives and I know I'll never forget it. Not only were we on cloud 9, but our family and friends also had the best time ever. It was truly a memorable night...my perfect night. My favorite memory from the wedding day was seeing Joe for the first time. I was so excited to see him the whole day, and once I caught my first glimpse of him walking down the aisle, I knew I would be happy forever.